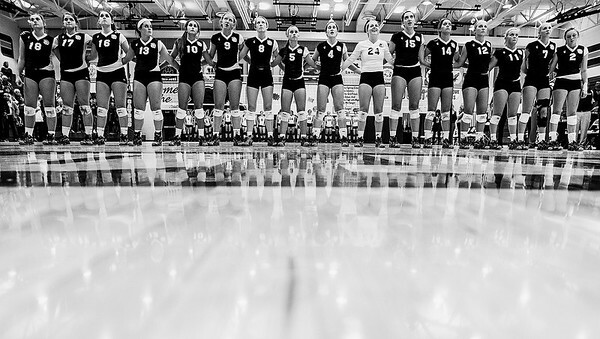 Kyle Grillot - kgrillot@shawmedia.com The Cary-Grove volleyball team lines up, facing the american flag, during the playing of the National Anthem before the start of the girls volleyball match against Crystal Lake South Tuesday, October 7, 2014. 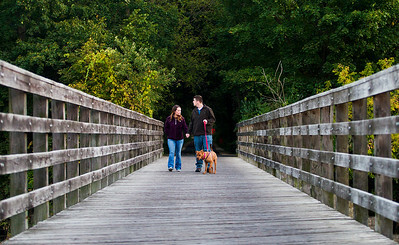 Kyle Grillot - kgrillot@shawmedia.com Heather Mack (left) and her husband Ryan, take time Tuesday evening to walk on the Prairie Trail with their 8-month old rescue dog, Molly, on a bridge over the Fox River in Algonquin. Kyle Grillot - kgrillot@shawmedia.com The Crystal Lake South team celebrates a scored point during first game of the girls volleyball match against Cary-Grove Tuesday in Crystal Lake. 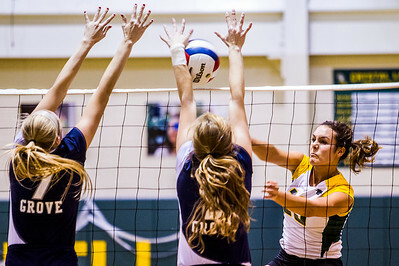 Crystal Lake South beat Cary-Grove, 25-19, 25-23. 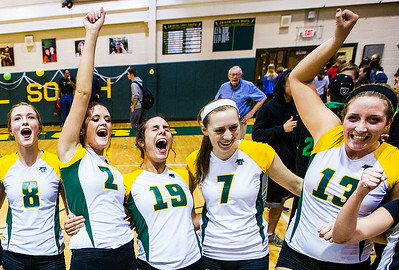 Kyle Grillot - kgrillot@shawmedia.com The Crystal Lake South team including Cassy Sivesind (from left), Emma Burkle, Abigail Marchewka, Jamie Vance, and Kendall Kilberger celebrates after beating Cary-Grove in two games on Tuesday in Crystal Lake. 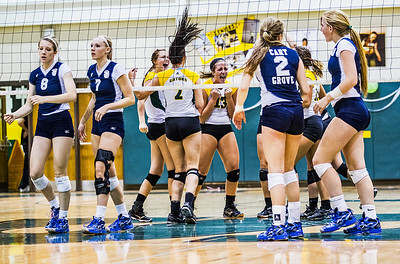 Crystal Lake South beat Cary-Grove, 25-19, 25-23. Kyle Grillot - kgrillot@shawmedia.com Cary-Grove senior Brianne Coffey celebrates a scored point during the first game of the girls volleyball match Tuesday in Crystal Lake. 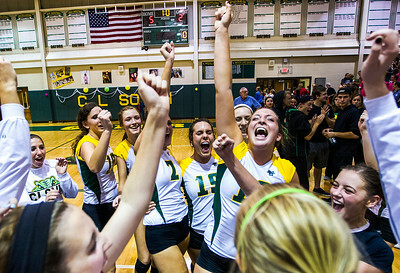 Crystal Lake South beat Cary-Grove, 25-19, 25-23. 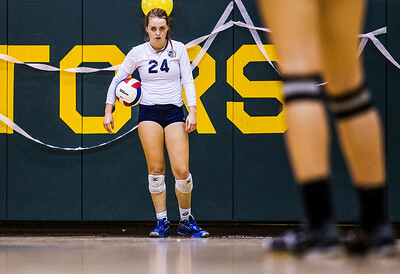 Kyle Grillot - kgrillot@shawmedia.com Cary-Grove senior Brianne Coffey prepares to serve the ball during the second game of the girls volleyball match Tuesday in Crystal Lake. 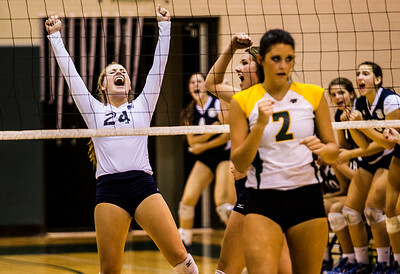 Crystal Lake South beat Cary-Grove, 25-19, 25-23. Kyle Grillot - kgrillot@shawmedia.com Crystal Lake South senior Victoria Falbo jumps in celebration after a scored point during the first game of the girls volleyball match against Cary-Grove Tuesday in Crystal Lake. Crystal Lake South beat Cary-Grove, 25-19, 25-23. Kyle Grillot - kgrillot@shawmedia.com Crystal Lake South senior Abigail Marchewka (right) hits the ball towards Cary-Grove senior Morgan Lee and junior Erin Olson during the girls volleyball game Tuesday in Crystal Lake. Crystal Lake South beat Cary-Grove, 25-19, 25-23. Kyle Grillot - kgrillot@shawmedia.com Crystal Lake South senior Carly Nolan (right) hits a kill past Cary-Grove juniors Allison Splitt and Erin Olson during the second game of the girls volleyball match Tuesday in Crystal Lake. 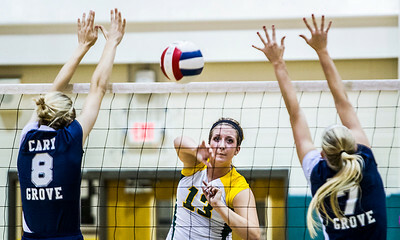 Crystal Lake South beat Cary-Grove, 25-19, 25-23. Kyle Grillot - kgrillot@shawmedia.com Crystal Lake South senior Carly Nolan (left) hits the match-winning kill past Cary-Grove senior Abigail Schebel and junior Allison Splitt during the second game of the girls volleyball match Tuesday in Crystal Lake. 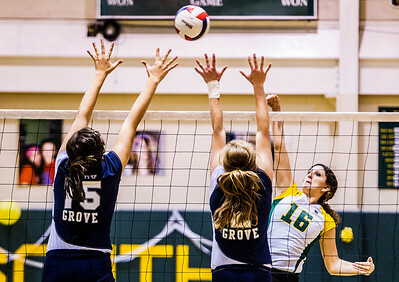 Crystal Lake South beat Cary-Grove, 25-19, 25-23. 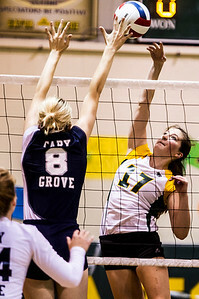 Kyle Grillot - kgrillot@shawmedia.com Crystal Lake South Mary Wille (right) hits the ball towards Cary-Grove senior Abigail Schebel during the first game of the girls volleyball match Tuesday in Crystal Lake. Crystal Lake South beat Cary-Grove, 25-19, 25-23. Kyle Grillot - kgrillot@shawmedia.com The Crystal Lake South team celebrates after beating Cary-Grove in two games on Tuesday in Crystal Lake. Crystal Lake South beat Cary-Grove, 25-19, 25-23. Kyle Grillot - kgrillot@shawmedia.com Crystal Lake South junior Kendall Kilberger (center) hits a kill past Cary-Grove seniors Abigail Schebel and Morgan Lee during the second game of the girls volleyball match Tuesday in Crystal Lake. Crystal Lake South beat Cary-Grove, 25-19, 25-23. Kyle Grillot - kgrillot@shawmedia.com Cary-Grove junior Morgan Lee grimaces after landing on her injured knee during the second game of the girls volleyball match Tuesday in Crystal Lake. Crystal Lake South beat Cary-Grove, 25-19, 25-23. Kyle Grillot - kgrillot@shawmedia.com Cary-Grove junior Erin Olson prepares to serve the ball during the second game of the girls volleyball match Tuesday in Crystal Lake. Crystal Lake South beat Cary-Grove, 25-19, 25-23. 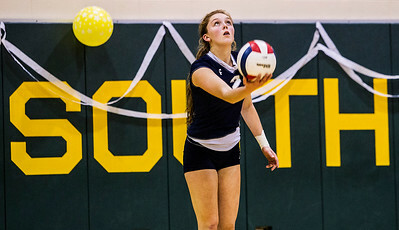 Cary-Grove senior Brianne Coffey prepares to serve the ball during the second game of the girls volleyball match Tuesday in Crystal Lake. 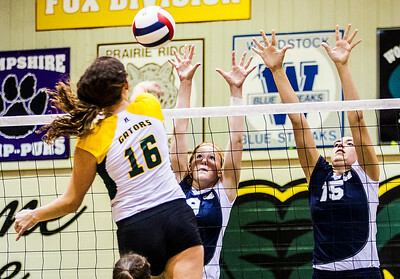 Crystal Lake South beat Cary-Grove, 25-19, 25-23.